If you’re after a sweet way to lose weight with fruit that is high in fibre, figs are the way to go! Buy them whilst in season. This recipe is quick, simple, refreshing and most importantly satisfies those sweet cravings, yet keeps the weight off! 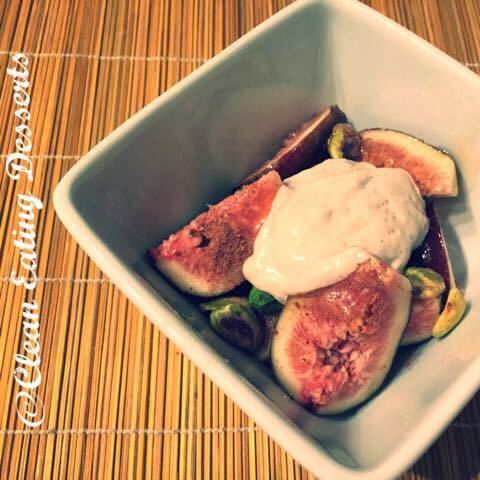 Figs can be eaten on their own or in this case – a great accompaniment with organic cashew yoghurt! Place the figs in a bowl and add the nuts. Sprinkle the spices and drizzle the syrup or honey on top. Place the cashew yoghurt on top and voila! TIP – If you’re not vegan, honey is best consumed raw, as the heating process destroys the real goodness of honey.